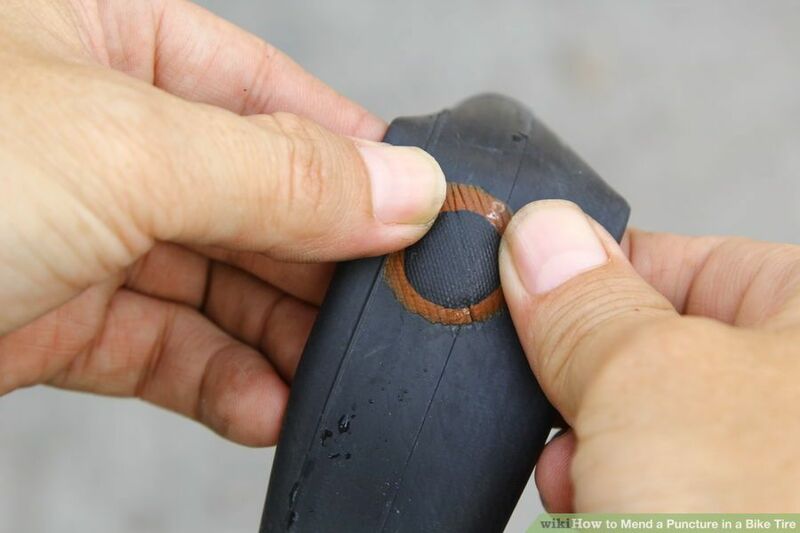 Nothing will wreck a bike ride faster than a flat tire, but fixing a puncture can be a snap, with a little elbow grease and some common tools and products! Locate the cause and size of the puncture. If the tire is blown out, or has a large hole, it will have to be replaced. 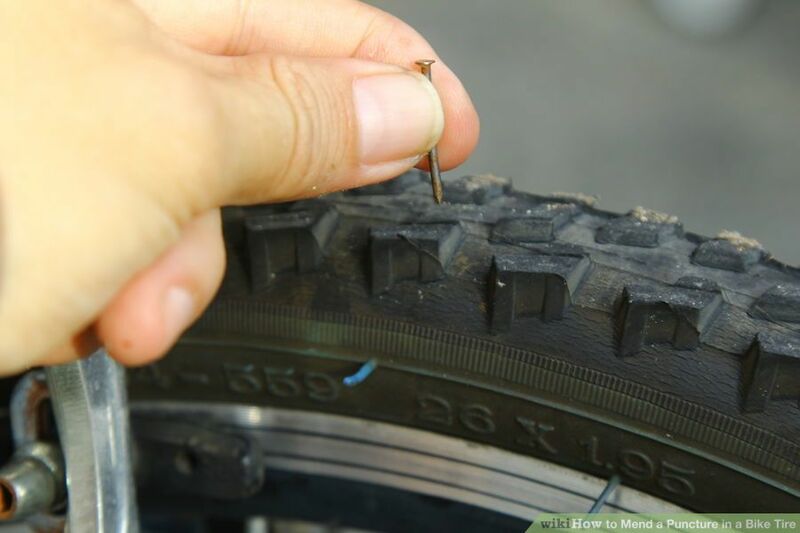 If you rode it through a patch of thorns, it may have dozens of holes, but if it is a single small puncture, for instance a nail, often it can be fixed on the bike. It is better if it`s only minimal. Turn the bike over so it is standing on the seat and handlebars. Make sure it is not on the brake levers or the gear shifter. A block of wood may be needed to support it off of these items. Release the wheel of the bike. Spin the tire slowly. 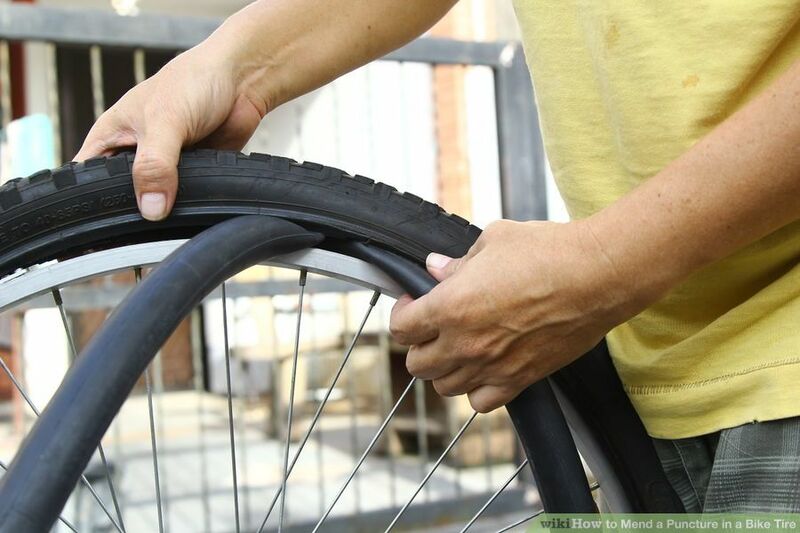 Look for anything sticking out of the tire, such as a nail, a piece of wire, a screw, or any other object. Let the remaining air out of the tube. 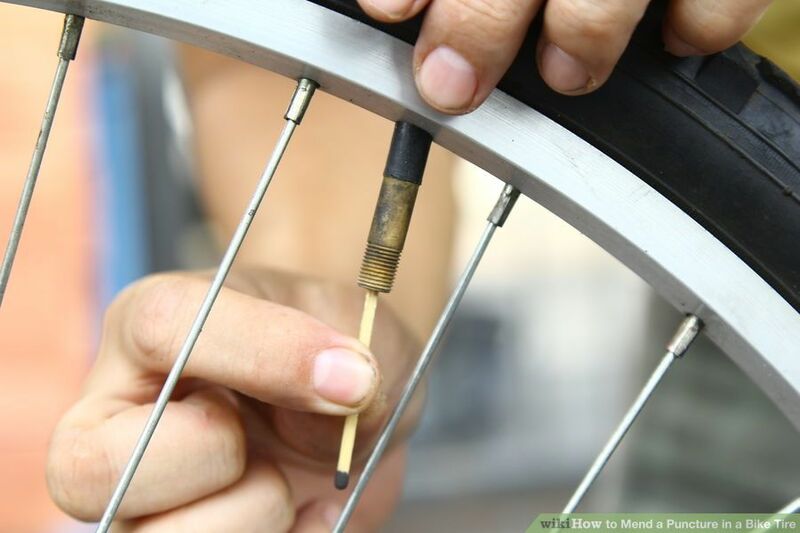 You may want to invest in a tire valve tool, but a matchstick, or ink pen can be used to depress the schrader valve stem to do this. The valve stem is the small round piece of metal underneath the plastic cap where air is put into the tire. Pry the tire off the rim. 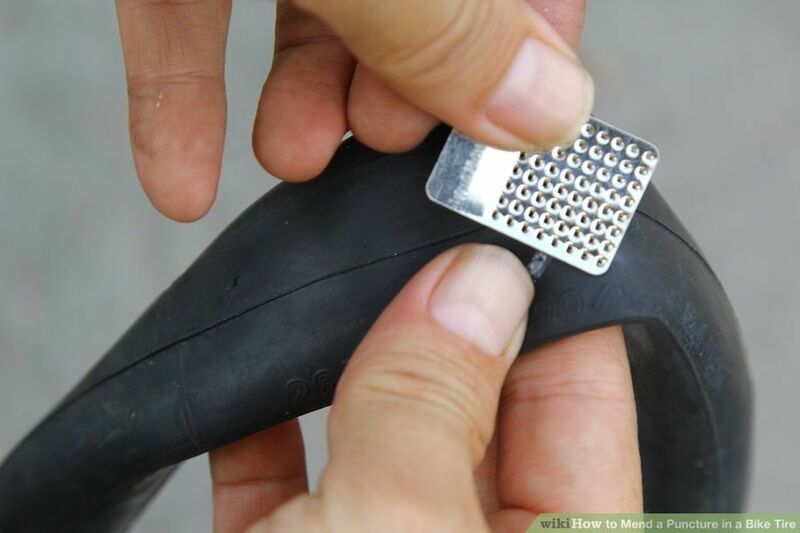 Use tire levers to remove the tire from the rim. Insert one between the rim and the tire, push down on the lever to lift the tire from the rim, insert the second tire lever, and run it around the rim to remove the tire. 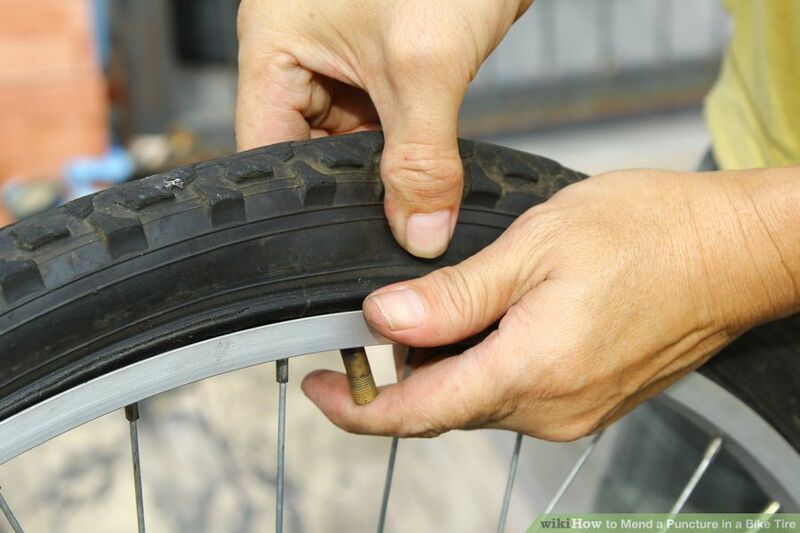 If you don’t have tire levers you may use a screwdriver as follows: Push a dull flat blade (common) screwdriver between the tire bead and the rim, and pry the edge of the tire off the rim. 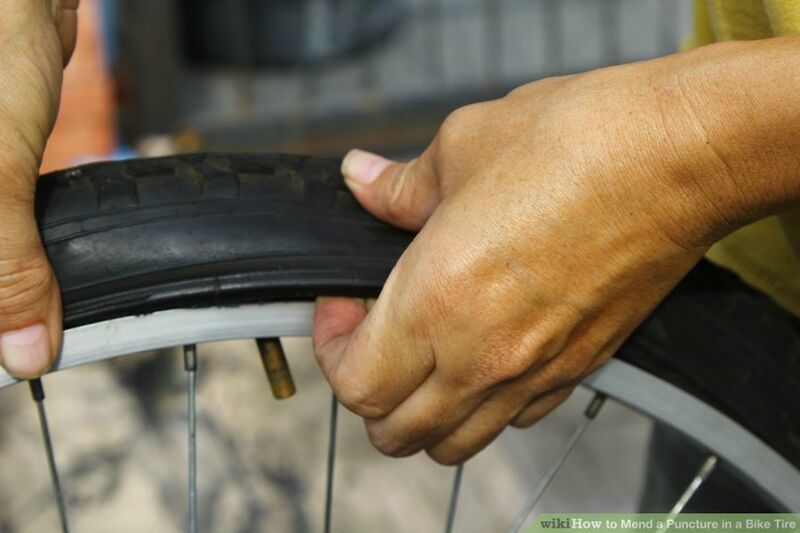 You will need to pry the tire loose around the rim, about an inch or two (2.5 cm – 5 cm) apart, until the tire becomes loose enough to pull free on one side. 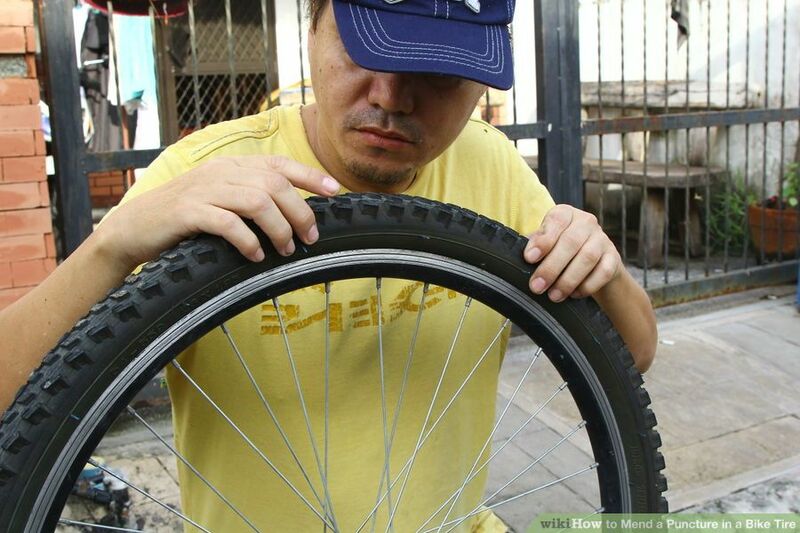 Lift the tube out of the tire. Be careful not to rip the valve stem off. 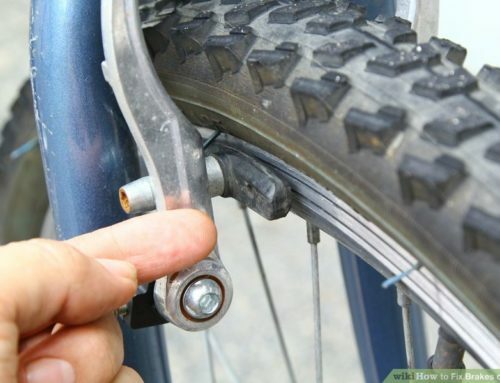 The tube should be hanging between the rim and the frame, so if it is a back wheel, don’t let it become entangled with the gears or chain. 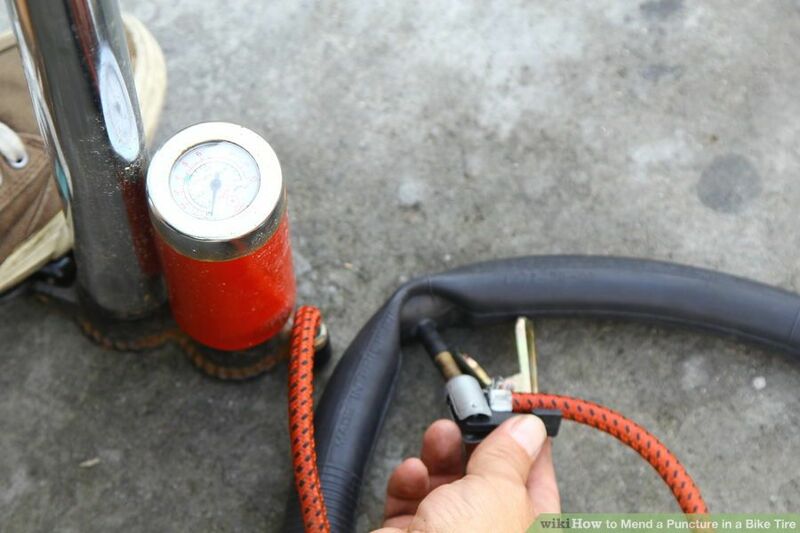 Pump enough air into the tube to inflate it sufficiently to find the leak. 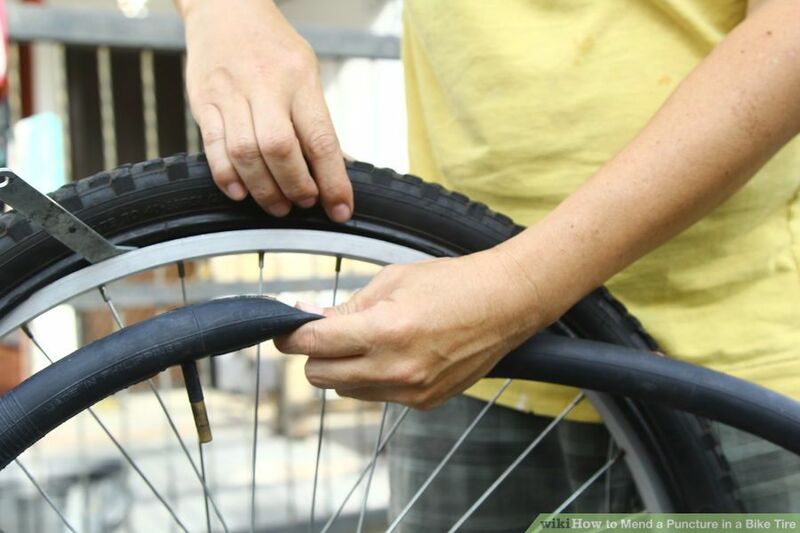 A bike tube will double or triple its original diameter, and the more air, the more the leaking hole will expand, making it easier to find it. Look around the tube for a small hole. Feel and listen for air escaping. 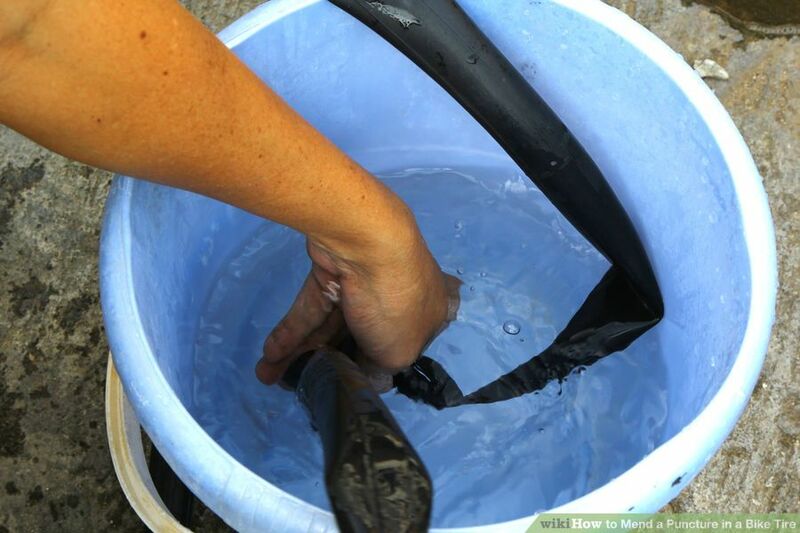 An even easier way is to hold part of the tube under water, for example in a bucket, to see bubbles escaping from the hole. Mark the location of the hole when you find it. Use a ballpoint pen or a piece of chalk to draw a large “+” centered on the puncture. Otherwise, you may have difficulty applying the patch. Remove the air from the tube once more. Buff the area where you will install your patch. Most patch kits come with a small metal rasp or a postage stamp-sized piece of sandpaper to do this. 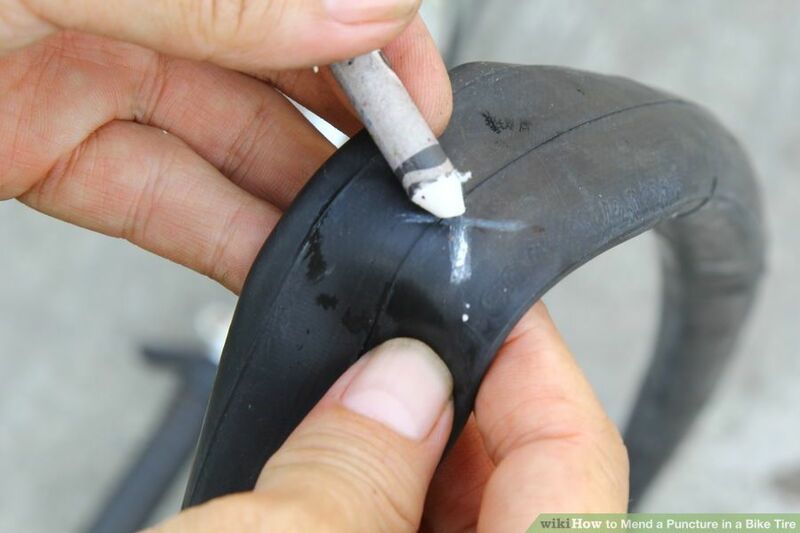 Spread a thin layer of glue around the puncture site. Allow it to dry until the liquid gloss disappears. Let as much air as possible out of the tube. Peel the plastic backing from the patch. Be careful not to touch the sticky adhesive surface, and place the sticky side on the tube, pressing it firmly into place. You will need to use one hand to hold the back of the tube to press hard enough to get the patch to seal. 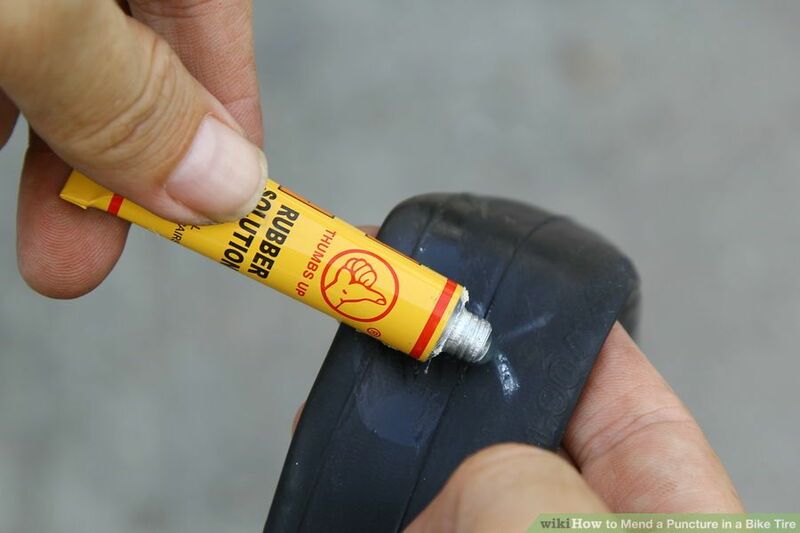 Slide the tube back into the tire. 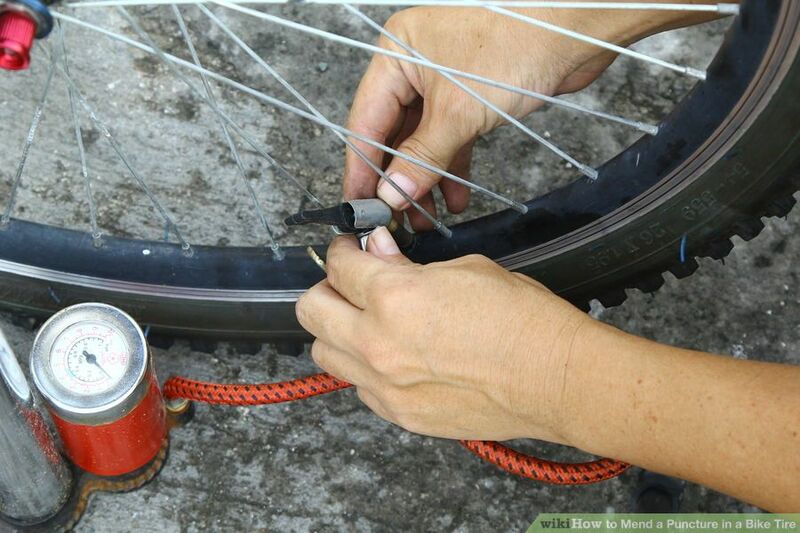 Be sure that the valve stem is aligned with the hole in the rim it sticks out of. Push the tire back on with the palms of your hands. Important: Avoid using levers if possible, and never use a screwdriver to perform this step. 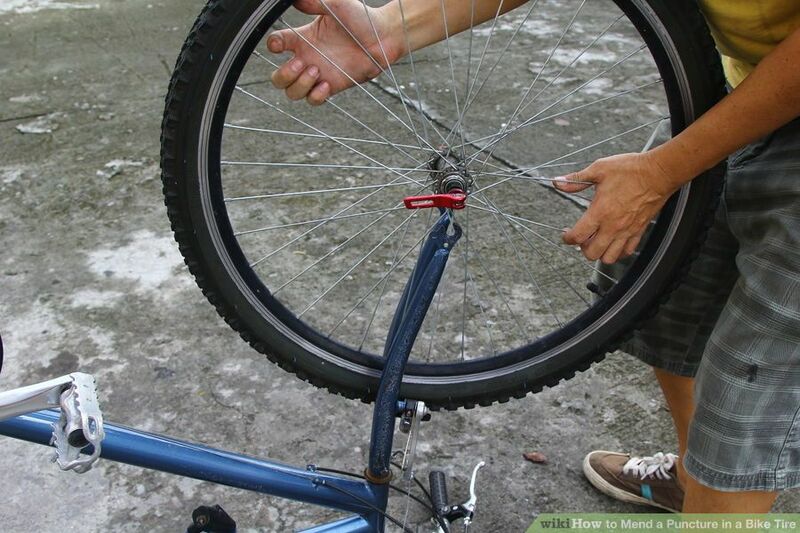 The object is to push the bead of the tire back over the rim, without pinching it and possibly causing another puncture. 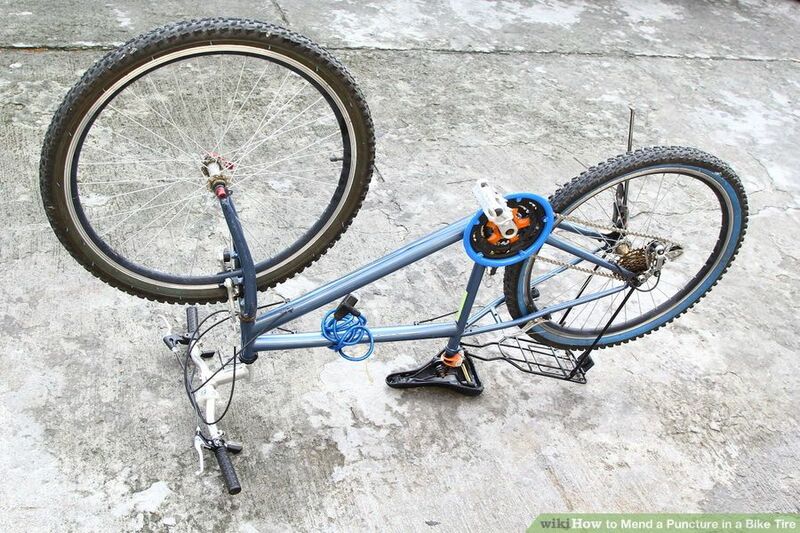 Put the wheel back on the bike. Reconnect the brake if you disconnected it to remove the wheel. If it was a back wheel, work the chain around the gear cluster. Verify that the rim is centered between the brakes. Then tighten down the nuts or quick-release lever firmly. 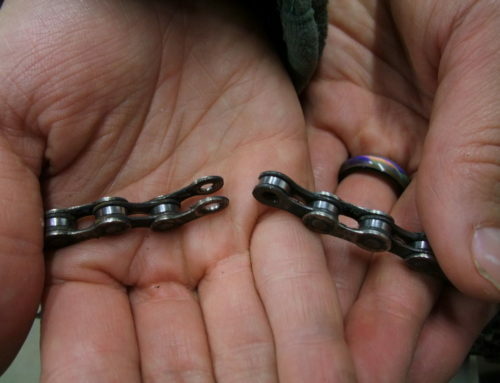 How to fix a bike chain?